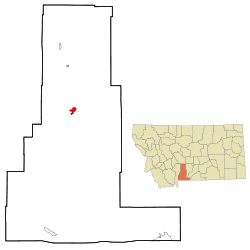 Livingston is a town in and the county seat of Park County, Montana, United States. Livingston is located in southwestern Montana, on the Yellowstone River, north of Yellowstone National Park. The population was 7,044 at the 2010 census. The founding of the small historical railroad and ranching town of Livingston, Montana is a direct result of the Northern Pacific Railway (NPR). This site became a centralized point in the Rockies and the NPR's location for railroad shops to service NPR steam trains before their ascent over the Bozeman Pass, the highest point on the line. Livingston also became the first gateway town to America's first national park, Yellowstone National Park. This is to where the NPR began promoting heavily to visitors from the East. The NPR operated a branch line running some fifty miles south through Paradise Valley to, first the Cinnabar station and later to Gardiner, Montana. Downstream (the Yellowstone River), approximately 3 miles from present day Livingston, was where an old fisherman named Amos Benson built a log cabin in 1872. This is where a ferry, a trading post and a small community called Benson's Landing was. Across the river from Benson's Landing in June 1882 was the camp of about 40 tents of the Northern Pacific survey crew. This is where they thought that the supply store site they were looking for should be. On July 14, 1882, a man who worked for the Northern Pacific named Joseph J. McBride arrived with orders to find another site to build the store. Two days later on July 16, 1882 George H. Carver, a man who would become a major local businessman and local political leader, arrived at the site of present-day Livingston. Carver and McBride became the first local residents when they pitched their tents on the 16th. Also on the 16th arrived 30 freight wagons drawn by 140 head of oxen, carrying 140,000 lbs. of merchandise. The supply store was to be of Bruns and Kruntz, contractors. Eventually the tents gave away to log cabins. All of Benson's Landing encampment moved up the river to Carver and McBride's camp within 10 days of freight train's arrival. This new settlement was called "Clark City" after Heman Clark, the principal contractor for the Northern Pacific from the Missouri westward. By fall the town was well established and an election poll in November 1882 counted 348 votes for delegates to congress. Clark City was on the southeast side at the East end of Lewis St. just southwest of the KPRK, and is now part of Livingston. B.F. Downen built the first permanent residence (out of wood) and Frank White owned the first saloon. Clark City eventually had 6 general stores, 2 hotels, 2 restaurants, 2 watchmakers, 2 wholesale liquor dealers, 2 meat markets, 3 blacksmiths, 1 hardware store, 30 saloons and a population of 500 people. As Clark City was growing nobody realized that the Northern Pacific had marked on their maps a town called Livingston at the same place. The railroad had officially reached Clark City on November 22, 1882. In October 1882 a post office was chartered for Clark City. In November, Livingston received its charter. That was when they decided that Livingston be located a short distance away, and there established a profit of $200,000 for the ones who invested in the surveyed property - those in knowledge of Northern Pacific doings. Then Clark City residents bought lots to the northwest, in Livingston and moved. The birth of Livingston was the death of Clark City. The walking distance between was considerable and Clark City became stream-and-bog urban wildland. Very few buildings still remain. On December 21, 1882 Livingston was incorporated and originally renamed in honor of Johnston Livingston, pioneer Northern Pacific Railway stockholder, director and friend of Northern Pacific Railroad President Henry Villard. Johnston Livingston was director from 1875–1881 and 1884–1887. Crawford Livingston Jr., Johnston's nephew is who the name Livingston is more commonly credited to. Crawford bought heavily of real estate after the survey, and who on July 17, 1883, established the First National Bank in the city. Often he spoke of Livingston as "his town," and he apparently enjoyed the publicity of supposedly having a city named for him. However the name Livingston has always stood out in the Northern Pacific official family. Livingston is along the Yellowstone River where it bends from north to east towards Billings and in proximity to Interstate 90. In July 1806 Captain William Clark of the Lewis and Clark Expedition camped on the city's present outskirts on the return trip east preparing to descend the Yellowstone River. Clark's party rejoined the Lewis party at the confluence with the Missouri River, near Williston, North Dakota. Although a small city, Livingston has a number of popular tourist attractions. The Livingston Depot, built in 1902 after two predecessors, is a restored rail station that today houses a railroad museum open from May through September. The Yellowstone Gateway Museum documents regional history from one of the oldest North American archaeological sites to Wild Western and Yellowstone history. The International Fly Fishing Federation's museum is an extensive introduction to a popular game sport and hosts annual enthusiasts meetings. The city was inhabited for two decades by Calamity Jane and visited by a number of traveling members of European royalty. In 1938, Dan Bailey, an eastern fly-fisherman, established his Dan Bailey's Fly Shop and mail order fly tying business on Park Street where it still resides today. In Livingston is the Fly Fishing Discovery Center, a museum operated by the Federation of Fly Fishers. Actors Peter Fonda, Margot Kidder, as well as Saturday Night Live alumnus Rich Hall, musician Ron Strykert, novelist Walter Kirn, and poet Jim Harrison have lived in the city. Jimmy Buffett mentions Livingston in multiple songs. Its economy is flat, and like the rest of the state, the unemployment rate is below the national average. Almost 50% its workforce commutes to Bozeman, as well as the destination resort Chico Hot Springs twenty-five miles south, and various campsites and ranches in Paradise Valley. Recently, the city has invested in creating attractions and accommodation for tourists visiting during the Lewis and Clark bicentennial years. Livingston and its immediately adjacent area has 17 sites listed on the National Register of Historic Places, enumerated within Park County's NRHP listings. It has a sister-city relationship with Naganohara, Japan. Livingston is located at 45°39′32″N 110°33′49″W﻿ / ﻿45.65889°N 110.56361°W﻿ / 45.65889; -110.56361 (45.658840, -110.563718), at an elevation of 4,501 feet (1372 m). According to the United States Census Bureau, the city has a total area of 6.03 square miles (15.62 km2), of which, 6.02 square miles (15.59 km2) is land and 0.01 square miles (0.03 km2) is water. Livingston has some of the warmest winters in the state, but the temperature can feel cold because Livingston is also one of the windiest places in the United States, having the 2nd highest average wind speed among airport/AMOS stations from 2000 to 2010. As of the census of 2010, there were 7,044 people, 3,356 households, and 1,744 families residing in the city. The population density was 1,170.1 inhabitants per square mile (451.8/km2). There were 3,779 housing units at an average density of 627.7 per square mile (242.4/km2). The racial makeup of the city was 96.2% White, 0.1% African American, 0.8% Native American, 0.3% Asian, 0.6% from other races, and 2.0% from two or more races. Hispanic or Latino of any race were 2.5% of the population. There were 3,356 households of which 24.7% had children under the age of 18 living with them, 39.2% were married couples living together, 9.1% had a female householder with no husband present, 3.7% had a male householder with no wife present, and 48.0% were non-families. 40.4% of all households were made up of individuals and 14.3% had someone living alone who was 65 years of age or older. The average household size was 2.07 and the average family size was 2.81. The median age in the city was 41.1 years. 21% of residents were under the age of 18; 5.6% were between the ages of 18 and 24; 28.3% were from 25 to 44; 28.9% were from 45 to 64; and 16.2% were 65 years of age or older. The gender makeup of the city was 48.5% male and 51.5% female. At the 2000 census, there were 6,851 people, 3,084 households and 1,751 families residing in the city. The population density was 2,601.3 per square mile (1,005.8/km²). There were 3,360 housing units at an average density of 1,275.8 per square mile (493.3/km²). The racial makeup of the city was 96.39% White, 0.31% African American, 0.98% Native American, 0.50% Asian, 0.60% from other races, and 1.23% from two or more races. Hispanic or Latino of any race were 2.16% of the population. There were 3,084 households of which 26.7% had children under the age of 18 living with them, 43.8% were married couples living together, 9.1% had a female householder with no husband present, and 43.2% were non-families. 37.5% of all households were made up of individuals and 15.6% had someone living alone who was 65 years of age or older. The average household size was 2.16 and the average family size was 2.86. Age distribution was 22.7% under the age of 18, 7.5% from 18 to 24, 27.5% from 25 to 44, 23.6% from 45 to 64, and 18.6% who were 65 years of age or older. The median age was 40 years. For every 100 females there were 95.0 males. For every 100 females age 18 and over, there were 90.7 males. The median household income was $28,980, and the median family income was $40,505. Males had a median income of $26,619 versus $18,684 for females. The per capita income for the city was $16,636. About 5.6% of families and 12.1% of the population were below the poverty line, including 15.0% of those under age 18 and 10.4% of those age 65 or over. Historically a railroad city until the mid-1980s, the city today depends significantly on tourism. The Federation of Fly Fishers is based in Livingston. Livingston Enterprise is a local daily newspaper, and the Livingston Current (preceded by the Park County Press and Park County Weekly) is a weekly newspaper. The monthly Montana Pioneer and bimonthly Atlantis Rising are also Livingston-based. ^ Aarstad, Rich; Arguimbau, Ellie; Baumler, Ellen; Porsild, Charlene; Shovers, Brian (2009). Montana Place Names. Helena, Montana: Montana Historical Society Press. p. 157. ISBN 0-9759196-1-X. ^ Berryman, Jack W. (2006). Fly-Fishing Pioneers and Legends of the Northwest. Seattle, WA: Northwest Fly Fishing LLC. pp. 101–107. ISBN 978-0-9779454-0-5. ^ "Average Weather for Livingston, MT - Temperature and Precipitation". Weather.com. Retrieved August 5, 2010. ^ "Census of Population and Housing". Census.gov. Retrieved May 25, 2017. ^ "City of Livingston CAFR" (PDF). livingstonmontana.org. Retrieved 7 April 2018. ^ "Arthur Blank's Spirit of Giving Knows No Season-Paradise Valley Pop Stand Owner and Home Depot Co-Founder Makes More to Give More". The Montana Pioneer. Archived from the original on 2010-09-24. Retrieved 2010-08-24. ^ Whithorn, Doris; Bill Whithorn (1979). Calamity's In Town-The Town Was Livingston, Montana. Pray, Montana: Wan-I-Gan. ^ Cohen, Stan (2004). "The Murray Hotel". Montana's Grandest-Historic Hotels and Resorts of the Treasure State. Missoula, Montana: Pictorial Histories Publishing Company. pp. 77–80. ISBN 1-57510-111-4. 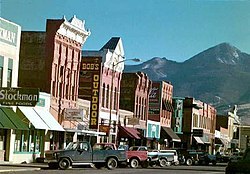 Wikimedia Commons has media related to Livingston, Montana.